In a slump, the mental and physical combine to confuse, and the player ends up in a spiral. “You go up to the plate and you think about your weaknesses, and you start focusing on them, and you start chasing,” Brandon Moss said before a game against the Giants, adding “it all starts to spin around.” Since having offseason hip surgery, the Cardinals’ slugger has been spinning in both facets of the game. A recent tear might be the result of getting right, though. An adjustment to his mechanics, a milestone in his workouts, and a slight tweak to his approach all recently came together. The result looks more like the Moss that averaged 33 home runs for every 600 plate appearances coming into this season. To illustrate how he’s gotten his game back together, there might not be a better way than to have Moss take us through three plate appearances against Rubby de la Rosa last week. The pitcher got the better of him once, but when the batter did his damage, it was the result of a convergence of factors. Before he even stepped to the plate for the first time against de la Rosa, Moss had two physical changes that were starting to favor him. But Moss is finally working out again, and that’s important to him, even if he originally hurt himself doing those same squats. “I’m 205 now,” he said of his weight. “I feel good because I’m lifting again. I’m getting closer. And that’s where I drive the ball from, the strength in my legs.” Maybe that return to the weights inspired his teammates to make bench-lifting motions after his double Tuesday night. If they were telling him to lift more to get that extra three feet of distance, he responded well, hitting a walk-off home run later that game to dead center. That offseason surgery on a torn hip labrum put a crimp in Moss’ style, but getting back to full strength is harder than just getting physically healthy again. Bad health begets bad mechanics, and after you fix the broken thing, you have to re-find your mechanics. Part of the problem was weakness, but another was bad learned mechanics. “When you do it for so long one way, of course the other way isn’t going to feel right,” Moss said, agreeing that it was like a pitcher trying to unlearn bad habits acquired while trying to deal with a nagging injury. “I am dealing with mechanics I learned to cope,” he said. Moss before he reopened up his stance (left), and after (right). Two days before Rubby de la Rosa faced the Cardinals, Moss made a decision to go back to his old open stance, even if it didn’t feel right. He had enough strength to “get down into” his legs, and make it work, and immediately he felt that he was seeing the ball better. Moss sounds just like Braun when he talks of this skill. “When you’ve played the game long enough, you know yourself well enough to know what you’re set up for. There’s a sequence, and you know where you are on that, and you get caught in the guessing game. Then you swing just because you guessed right,” Moss felt. It’s a struggle to keep your mind open and not fall into the anticipation game. It’s a struggle from at-bat to at-bat, and it’s a struggle within one at-bat. 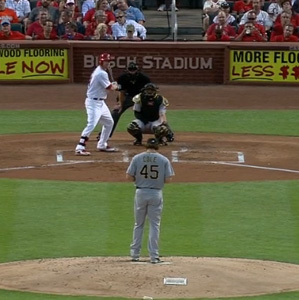 Brandon Moss knew this changeup was coming, in this location. 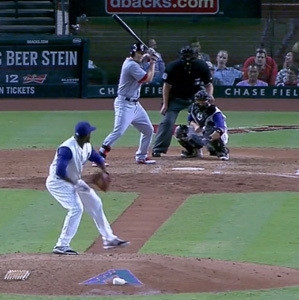 Here’s the changeup that Moss knew was coming, but laid off. Here’s the changeup that Moss tried to avoid anticipating. So getting it right meant getting right physically and mentally. And that’s not easy to do in the middle of a 162-game grind. If Brandon Moss keeps up the tear like the one he’s been on since he made the change — he’s batting .400/.520/1.000 in the 25 plate appearances since — here’s thinking that it’s beginning to feel right for the slugger. We hoped you liked reading Three At-Bats with Brandon Moss by Eno Sarris! Sorry, for my benefit, could you please provide Eno a reminder about which topics he’s allowed to cover? Or would it be better for the writers to run an outline of every piece by you before writing? Whichever is easier for you, I hate how these guys are ruining BDCGraphs lately. Hey, if you actually read this and yawned not because of the player name or the team name, then the remedy is super simple: don’t read my pieces any more. I mean, it is certainly up to the INDIVIDUAL to decide if he or she thinks BDC is an assclown, but I might suggest that the COLLECTIVE has already decided. I did post those and I stand by them. I did not post the “yawn” comment. I do not post like that. If I had a problem with this article I would give a much longer and more insightful post. Please do not be fooled by the BigDaddyCool impostors. They do not post like me. My past rhetoric speaks for itself. Why do you post your thoughts anyway? I mean, the reasoning for posting is to get a new idea across, voice disagreement in a way that begets change in the minds of fellow readers, or possibly prove your intelligence (the last one is a reasoning I do not like but one I will ackowledge as logical). By posting, you do none of those three. It would probably benefit you if you are shooting for the 2nd or 3rd reasoning for posting to make sure your rhetoric is more tactful so as to accomplish your goal. Also, I love how it’s always simplistic thoughts that have no backing. But I guess if you’re just posting to instigate people then you can continue to be disliked by everyone. If that’s the case, I may start posting as you just to make you look less intelligent too. It may be longer, but there’s certainly no precedent that would lead anyone to believe it would be insightful. chuckb – if you don’t see insight in my posts than I don’t know what to tell you, but I would guess you are a fan of one of the teams I pointed out gets lucky a lot. Cardinals? I bring a perspective that is unique. You would think the community would welcome the insight I have to offer and learn from it, but the groupthink is really strong here, and I’m starting to think it will take more than BigDaddyCool to break the spell. So does the meth addict ranting about the end of days on the street corner in his underwear, but that doesn’t necessarily mean he’s adding anything useful to the discourse. Jason B – Thank you for comparing me to a meth addict in the street in his underwear. I’m sure you apply these astute observations to your everyday life. Must be nice to work as a janitor at a local dive bar. I know you don’t work in business or any other respectable profession, because that kind of rhetoric would get you fired on the spot.